Mid-Century Cardholders - Cal-Mil Plastic Products Inc. Step 1: Find your products. Step 2: Add your products to your inquiry. 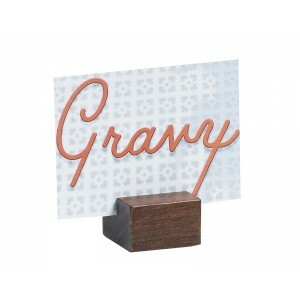 Display business cards, happy hour specials, place settings and more with our Walnut Card holders. This simple, yet sophisticated design will add a touch of elegance from your restaurant tables, to your business card on your desk at work. Sign up to get our monthly newsletter to stay up to date with Cal-Mil! © 2017 Cal-Mil. All Rights Reserved. Legal. Designed by FDI Creative.